Thanks to the world of trading beer, and reddit /r/beertrade I am now enjoying a Cinnamon Roll'd WnB. I am a fan of regular Wake n' Bake, I like to drink it in the morning while baking - the yeast, sugar, enzyme kind, not the trichomes kind. Although I am in favor of the reasonable use of both. I must admit that I don't think their combination is so hot. Anyhow back to the brew. It's very good, well worth the expense of trading. It's five degrees below zero out and I was a bit concerned (may have told my manager that needed to rush home in the middle of the afternoon to rescue my almost freezing ale) that it might freeze. But it made the trip safely, clocking in at 33.3 degrees Fahrenheit, and to back up that number, it was still liquid. Although I have seen at least one post on Beer Advocate - claiming that it is scientifically impossible for that to be the case. Bubblewrap is not to be underestimated. So the ale, it's pretty dark, nice head, cinnamon and coffee on the nose, and medium to full bodied. The flavor on the palate is also cinnamon and coffee, with a real nice sweetness to the cinnamon. The finish has a nice spice and sweetness to it as well. There is a slight dryness that is to be expected with a coffee stout, but it's very balanced. Like any coffee beer it's not something I want more than a pint of two of in a sitting, but that is simply what it means to be a coffee ale in my book. So it met my expectations, which were admittedly, pretty high. This is the kind of brew you want to enjoy fresh to get the full experience. Some ales cellar well. Others should just be enjoyed. I will never regret drinking and sharing two bottles of Founder's CBS fresh. On the other hand I do regret leaving at least two other brews in the cellar way past when they should have been. So my recommendation, if you haven't already got a bottle, ante up with that trade fodder in your cellar, get a Cinnamon Roll'd W-n-B and drink it NOW. You won't regret it. Thanks to Kyle for the great brew! Final thoughts, this ale has a nice magical malt combo that really pulls off the Cinnamon Roll. Kudos to the brains at Terrapin who came up with this malt bill and hop schedule, I am really impressed, nice job! This page contains a single entry by Brewmaster published on January 3, 2014 8:33 PM. Big Bad Baptist was the previous entry in this blog. 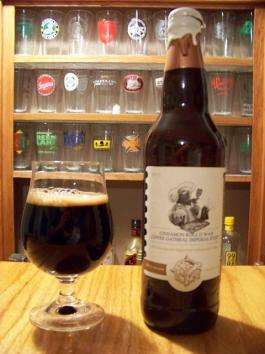 Dogfish Head - World Wide Stout is the next entry in this blog.